Nice! Just what I neededd! Roller was grimy. Seller would refund but not pay return ship. Had to dispute. fairly easy to use. it's too light and the anchor does work very well, you have to hold it down while rolling. fine for rolling small amount each time. not for making pasta for the whole family. 1. Instructions say to not wash it. 2. Cutters only indent the pasta, they don’t separate the strands on either setting. 3. Rollers are not very grippy so you really need to thin the dough before rolling 4. It I is inexpensive so maybe 1-3 are minor. Update: there are not “3 blade attachments” there is one double-blade attachment. I don’t think these people are Italian, their website says it makes Alfredo pasta as if that were a shape and not a sauce. 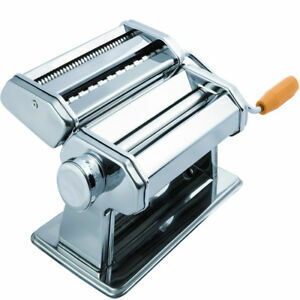 I used this pasta maker once time and was satisfied with the purchase. I think it was me or the consistency of the dough but the strands of pasta did not separate very easily. I think with a little dryer dough it will cut better. Overall it worked pretty good and the meal was delicious. It seems to be a solid machine after 3 uses. However, the noodles cutter doesn't cut all the way. I have to separate the noodles with my hands after it passes through the blade. Cylinders work good and it goes up to 9 of thickness, which makes a very thin pasta ideal for raviolis. Update: After a some more uses, the 'metal' finishing if the rolls started to peel off. I just starting making my own pasta and decided to try this guy out and it does not disappoint. I cleaned it first to get any dirt and grease off, but it is simple to use and straight forward to set up. It is not the fanciest machine out there but it gets the job done and is perfect for my kitchen. 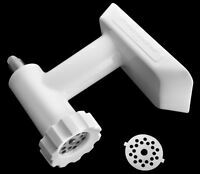 It does not take up much space and I would recommend to anyone who wants to start making their own pasta and not break the bank on a crazy roller.